Subscribe below to follow my beeswax candle making adventures! Beeswax is, of course, made by bees. 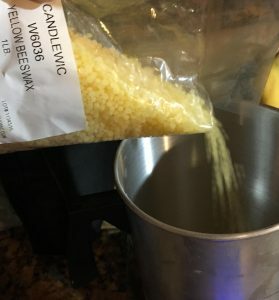 This natural wax is the least processed wax. When beekeepers extract the honey, they cut off the wax caps from each honeycomb cell. There is very little that has to be done to the wax to make it ready for candle making. Once it is gathered, there may be a purification process, but it does not involve chemicals. “When beekeepers extract the honey, they cut off the wax caps from each honeycomb cell with an uncapping knife or machine. Its color varies from nearly white to brownish, but most often a shade of yellow, depending on purity, the region, and the type of flowers gathered by the bees. Wax from the brood comb of the honey bee hive tends to be darker than wax from the honeycomb. Impurities accumulate more quickly in the brood comb. Due to the impurities, the wax must be rendered before further use. The leftovers are called slumgum. White beeswax has the least amount of impurities and was historically used by royalty. The white beeswax, as you can guess, commanded a high price. Apparently white beeswax also burns differently than yellow beeswax. I haven’t tested this yet, but I have read that white beeswax burns more cleanly. I’m guessing because it has less of the natural impurities in it. In short, beeswax is a fine natural wax to work with. It can be used without fragrance and gives off a naturally light sweet scent when burning. It can be used in containers, as votives, tapers, molded pillars and rolled candles. 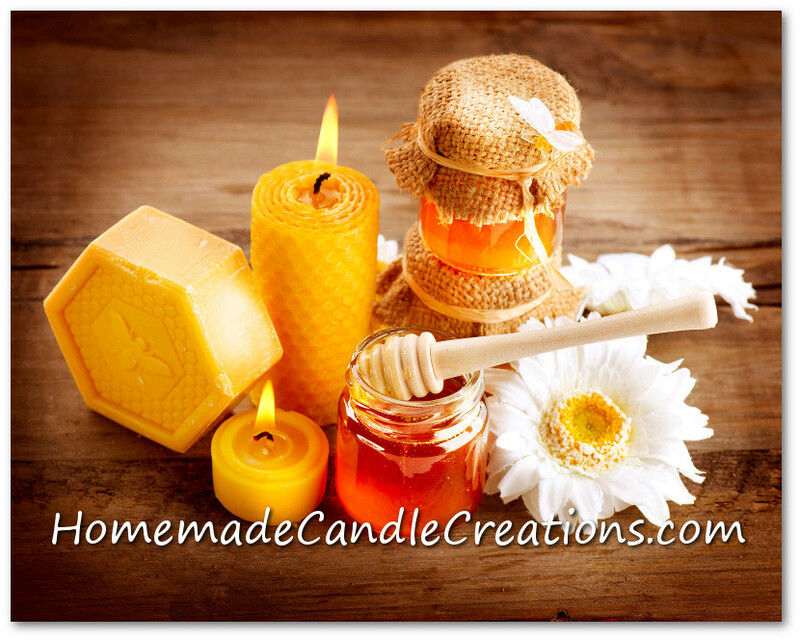 Beeswax has been used for candles for thousands of years. In fact, there is evidence dating from 3000BC found on the Greek island of Crete, as well as in Egypt. In the Middle Ages, beeswax was in short supply. Because of this, people mainly used cheaper tallow (animal fat) candles. Sadly, tallow smelled horrible when burning, sputtered and spat, and gave off black smoke. Beeswax, however, burned much more cleanly and had a sweet smell. Beeswax was more expensive because of it’s value and short supply and so was mainly used by the rich. Today, beeswax candles are still prized for their clean burn and sweet smell. As I said above, I will continue to add more information about beeswax candles to this page. I am very excited to be ordering some beeswax soon and start making my own! I have been using soy wax only up to this point so it will be fun and exciting to branch out! Sign up to our Newsletter and get a free wholesale suppliers list!